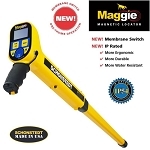 Schonstedt Magnetic Locator GA-52Cx is built tough and Made in the USA. 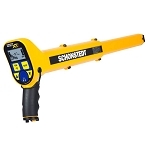 Take advantage of the Schonstedt Trade In Program and receive anywhere from $100 up to $250 credit towards the purchase of a new Schonstedt Locator. Details and Trade-In Form. Schonstedt GA-52Cx Magnetic Locators have set the standard for reliability and dependability in the detection of magnetic fields of iron and steel objects as well as energized power lines for over 40 years. 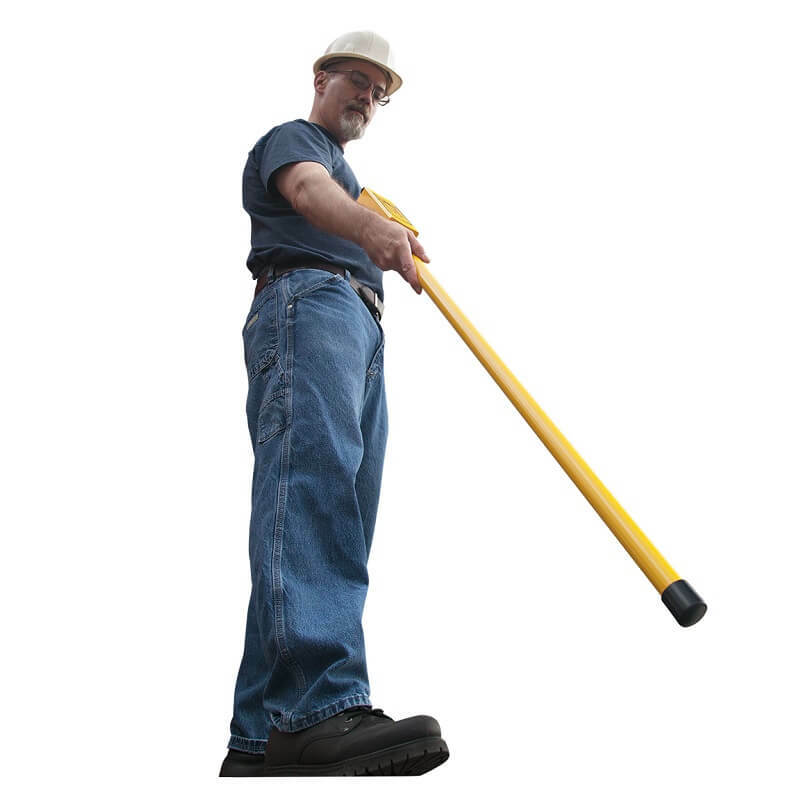 This magnetic sweepers unmatched sensitivity, rapid response, and ease of operation in detecting ferromagnetic items makes it the perfect piece of equipment for a variety of industries including surveying, construction and excavation, public works, utility companies, water and sewer companies, transportation, and facilities management. The most common types of ferrous items this can locate are septic tanks, well casing, manhole covers, survey and property pins, mag and PK nails, curb and valve boxes, corner markers, hazmat drums, and marker magnets. 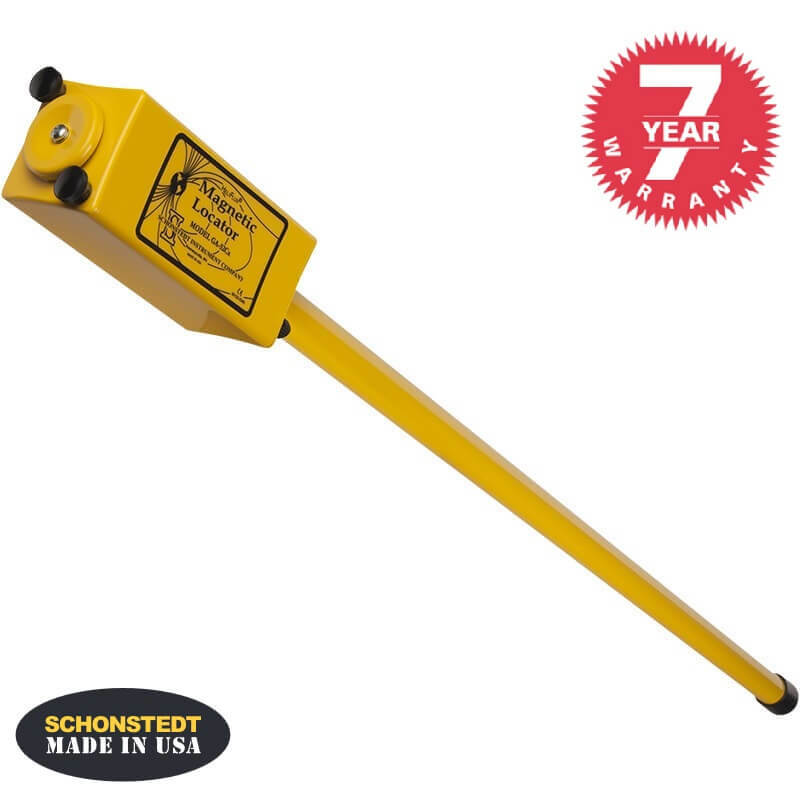 The Schonstedt GA-52Cx property pin detector does not respond to non-ferrous metals such as gold, aluminum, brass or copper. The GA-52Cx piezoelectric speaker emits a 40Hz idle tone that peaks in frequency when the locator’s tip is held directly over the object. This magnetic pin finder is designed for a one-hand operation, with only two knobs, an on-off/sensitivity knob and volume knob, located on the underside of the cover. The location of the knobs provides easy access, protects the knobs, and contributes to the overall ruggedness and dependability of the magnetic locator. 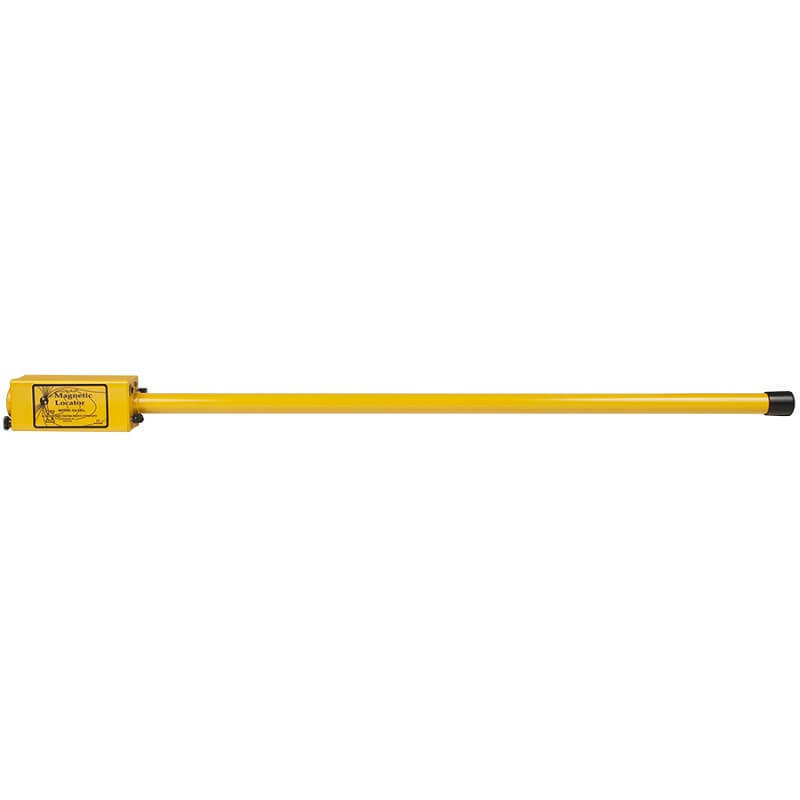 There are 5 levels of sensitivity for improved pinpoint accuracy making it the ideal tool to track down small objects such as a PK nail buried up to 12“ deep or locating larger items at lower depths. The ferromagnetic locator can also be used to detect a 4” diameter cast iron pipe at a depth of up to 10 feet, reinforced bars on a septic tank at a depth of 4 feet in addition to well casing buried up to 18’ deep. These Schonstedt locators are designed to withstand the rigors of daily on-site usage and a wide range of environmental conditions. This utility locator can be used in flooded areas as long as the electronic unit is kept out of the water. It can even be used in snow by thrusting the locator as deep as necessary to locate the target. The model GA-52Cx is so rugged and dependable it’s backed by a 7 year warranty. This surveying property pin finder is equipped with Schonstedt patented HeliFlux sensors and weighs about 2.5 lbs. The GA-52Cx is a rugged, modular, all solid-state construction with high-performance components in an aluminum casing. The locator is approximate 42 in. long with a waterproof length of 34.5 in. The two 9-Volt batteries provide about 40 hours of intermittent usage. One of the more popular uses for the GA-52Cx is for a professional surveyor to locate property markers or pins. When land surveying it is important to find the proper corners to properly map the location. 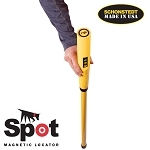 With this magnetic property pin locator you can easily sweep large areas to find the outline of the property. Reveals active circuits such as rear window defogger grids, radiant heat panels, etc. Output Approximately 40 Hz audio tone on speaker. Tone frequency increases or decreases with gradient-field intensity. This is a very solidly built locator. We've definitely abused these things as most technicians probably do and it still works like a charm. The pricing here is great and ships quickly. We love this locator as it is so easy to use. Turn on the unit and start locating. When you start getting interference you know you are in the right spot and can start pinpointing your dig. This is a very simple to use and well built locator. The speaker is loud and easy to hear even near roadways. Adjustible sensitivity makes finding objects more precisely. One of the easiest locators I've used. Of course the other ones have wires and plugs and transmitters to worry about. This one is simple and just looks for a change in the magnetic field between its two sensors.